Winter is the season for awful award shows and hearty beers. Barrel aged stouts are among the thickest, booziest beasts of the craft brewing world. So when a legendary brewer like Sierra Nevada decides to brew a new one, we have to uncork it. Sierra Nevada Barrel Aged Narwhal is the logical tweak on the 2013 GABF medal winning (silver 2013/bronze 2014) Narwhal Imperial Stout. The original base beer, a well hopped American stout bursting with roasted malt flavor, seemed a great candidate for setting down in a cellar, or better yet, to face the refinement of aging on bourbon casks. Unfortunately for some states like Ohio, the 12.9% ABV is too high to permit sales. Sampled from a corked and caged 22oz bottle. A Sierra Nevada employee posted on a Beer Advocate forum that the aging was “in fresh bourbon barrels (a combination of Willett single barrel, Heaven Hill and various Beam brands)”. For starters, the regular Narwhal is an impressively huge stout, combining sweet malts with a slight bitter kick of hoppy astringency. A very nice Russian imperial stout, with a bit of heat. A natural choice for barrel aging. Barrel Aged Narwhal keeps the sweet nose, with chocolate, whiskey, and anise, pouring with an unexpectedly large, latte colored head. One challenge in aging beer on bourbon is getting the flavor of the spirit, without drowning out what makes the beer what it is. In this case, Sierra Nevada gets the balance just right, starting out vanilla sweet, with an oak note mid-palette, and finishing with a slick boozy bourbon kick. The carbonation works though the thick body, washing it down with no lingering barrel. The 12.9% ABV is hardly noticeable in this BA stout wonder. Only the kick of hops has diminished. Sadly, some of the world’s best barrel aged stouts have no pedigree. Goose Island’s Bourbon Barrel Stout, Deschute’s The Abyss, The Bruery’s Black Tuesday all evoke desire for stout lovers, but none offer up a direct base beer. Experiencing a fresh stout, and then getting to see how it changes after the aging process is a fun exercise. With Sierra Nevada’s Barrel Aged Narwhal, the craft beer fan gets that opportunity to see what goes into the barrels. On top of the available pedigree, BA Narwhal is one hell of a beer. While not as complex as The Abyss, nor quite as superlative as BCBS, BA Narwhal outshines nearly all others, including most of the smaller brewery, small batch BA stout walez. More drinkable perhaps even than the lower ABV non-barrel aged version. Sweet, deep and potent; this is a limited release so grab one by the horn, tooth, or whatever. In the beginning there was Adam and Eve in the Garden of Eden. They were told not to eat the fruit from the apple tree. They were tempted by the serpent and made a “choice” to eat from the tree. Their actions were not preordained but rather the actions of beings with free will. At every fork in the road, there are signs marking the struggle of Good vs. Evil. The Lost Abbey was imagined as part of a crusade in this ongoing story of Good vs. Evil beer. Everywhere we turn these days, there is a battle being waged between those who make good beer and those who make evil beer. For co-founder and head brewer Tomme Arthur, the goal to brew great beers in the Belgian style, is one to be taken religiously. Above their barrel room (an addition to the space after taking over from Stone in 2006) is a large sign that reads “In Illa Brettanomyces Nos Fides”; effectively ‘In Brett we trust’. For those unfamiliar, Brett is an aggressive genus of wild yeast found in wood and the skins of fruit. It can contribute to the spoilage of wine, but in low levels adds a desirable flavor element to both wine and many beers (think a Flanders red, Gueze, lambic or other sours). 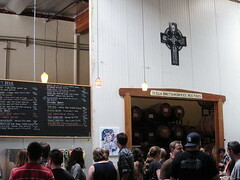 I visited The Lost Abbey brewery in early 2012, and was struck by the massive amount of complexity and depth of their beers. Barrel aging and the precise addition of Brett take beers to levels not known outside of Belgium. This high level brewing has not gone unnoticed. Many of Lost Abbey’s beers sit amongst the top reviewed beers on websites like RateBeer.com and BeerAdvocate.com with their limited releases commanding huge amounts on the gray market. 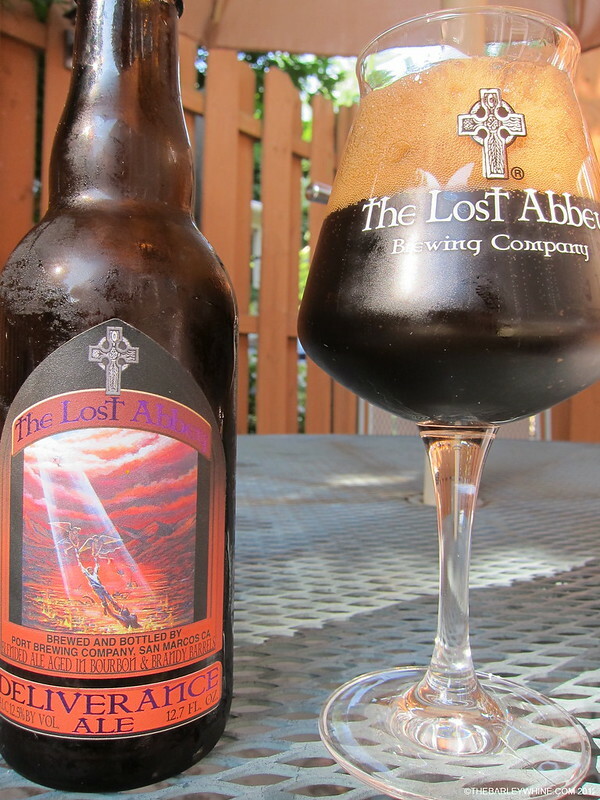 For this review we take a taste of one of those top-rate beers, Lost Abbey Deliverance Ale. The beer is asctually a blend of two barrel aged beers, the Bourbon barrel-aged Serpent Stout, a rich imperial stout and Angel’s Share, a brandy barrel-aged English style barleywine. Each of these beers on its own is a flavor tour de force. Will the combination be an amalgamation for the ages, or a Stygian blend, destroying the greatness each beer possesses on its own? From the first opening of the cork (Lost Abbey bottles are hit with additional yeast then corked and caged) this bottle conditioned wonder gives an audible ‘pop’, indicating the carbonation has held up. The nose hints of its origins with vanilla, oak, berries, raisins, and roasted malt. The pour is dark brown, with a tan head. I have only partial experience with the base beers, having sampled the excellent Serpent’s Stout on tap at Lost Abbey, sans barrel-aging, and later tasting a delicious but flat bottle of the Angel’s Share. Knowing how solid the blended beers were alone, the taste was greatly anticipated following such a bouquet. Deliverance did not disappoint. The first taste is massive dark chocolate, derived from the roasted malts of the bourbon barrel-aged Serpent’s Stout. Following chocolate, the palate turns to bourbon flavors, and dark fruits, with moderate carbonation carrying a medium body. The finish is slightly tart with hints of cherry and a gentle slap on the wrist from the well hidden 12.5% ABV. So much is going on. As any craft beer aficionado will no doubt attest to, mixing even the most delicious beers together rarely leads to anything but foul hodgepodge, worse than the least of its parts. This blend of two titanic Lost Abbey beers by contrast, yields one of the most complex and satisfying ales I have ever tasted. Lost Abbey Deliverance is more than a stout, more than barleywine, it is in fact a masterpiece. Beer cellaring is all the rage. In this review we put a year old bottle of Brooklyn Black Ops —the Woodford Reserve bourbon barrel aged Russian imperial stout that is bottled flat and then fermented with champagne yeast— up against a fresh bottle. As an restless beer geek, I’m hoping my patience with the 2010 is not rewarded. No blind tasting here, and no expectations other than deliciousness was forthcoming. Tasted them together at around 55 °F. Subtle whiskey and sweetness in the nose. Chocolate and some vanilla flavors. Less thick than any comparable Russian imperial stout. The alcohol is subtle. Fresh this is very drinkable for such high ABV. Huge chocolate, big vanilla notes, sweet and yummy. Great blend of bourbon, chocolate, a little spicy and hoppy. Well carbonated, with the same medium mouthfeel of the 2011. Has not lost much of the bourbon or chocolate in 1 year of aging. Go big or go home! While both Black Ops have the sophisticated drinkability surprising for a RIS, the ’10 was preferred by everyone. It was tasty when we reviewed it fresh, but now some of the booze has faded and the flavors are perfectly combined. Not usually a fan of aging brews, but in this case ’10 improved with age. Founder’s KBS was better with a year of age on it for me and we had the same surprising experience here. The ’11 is available in select locations. Seek one out for your cellar. [dropcap]H[/dropcap]aving reviewed the 2011 Founders KBS Kentucky Breakfast Stout already on draft, it is time to compare this legendary imperial stout against some other barrel aged beers as well as against the 2010 vintage. Does a beer that is already cave aged an entire year fade away after another year in the bottle? Does the KBS in the bottle live up to the promise of being one of the most flavorful, indulgent beers on the planet? For these answers and more, read on friends. For the tasting we drank five beers served in a blind sampling. In addition to the 2011/2010 KBS bottles we had the Brooklyn Black OPS, Kentucky Ale’s Kentucky Bourbon Barrel Ale and Arcadia Ale’s Shipwreck Porter. Each of these beers has spent time in a Bourbon barrel. Unlike Tennessee or Canadian whiskey, these Kentucky Bourbon barrels by law cannot be used more than once, meaning they are freshly loaded with the taste of the spirit as well as the qualities of American oak like vanilla and mocha tannins. If you do not like whiskey flavors there may still be something for you in the stouts and porter. Dave: Huge chocolate/coffee nose. Vanilla, chocolate flavors. Nummy; big flavors. I like it a lot. Steve: Big coffee nose, black, thick lacing; engulfing bourbon opening; big malt/ chocolate notes; harsh bourbon finish. An amazing blast of chocolate/coffee/vanilla/bourbon. The favorite of Dave and Rich for its heady mix of deliciousness. Hedonism in a glass. Dave: Huge chocolate nose, baking chocolate and whiskey flavors; a tad thin. Yum. The more balanced of the KBS brews. The extra year in the bottle has robbed it of almost nothing, except some of the bourbon finish and perhaps some of the coffee flavor. Steve’s favorite for the huge flavors acting in harmony. Dave: Whiskey nose, nice roasty flavor. Some vanilla notes, a bit hot. Could use some age, but good now. We have reviewed this in the past and it was again great, but not quite on par with the Shipwreck or KBS. Dave: Lots of vanilla aroma, tastes like Buffalo Trace Bourbon in an ale without the burn. Not bad. Rich: Lightest in color; hint of cream soda. Now this is an ale, not a dark stout or porter. And it is not aged for the 9-14 months the others are. Instead it only gets 6 weeks maturation before bottling. That said it is a drinkable, very sweet experience that would not be offensive to the palate for whiskey lovers wanting a sweet and refreshing brew. That said, it is not in the same weight class as the others reviewed here. Dave: Bourbon with a slightly sour aroma, raisins, chocolate and vanilla. Nice velvety feel, dry finish. Good, interesting dark fruit notes. Rich: Slight hint of fruit. Strawberry Frapaccino? Aged 14 (!) months in Bourbon barrels in abandoned mines, this Baltic Porter–a style similar to the potent imperial stout–is a great beer. The major fruit flavors pair seductively with bourbon, chocolate and vanilla to make a rich, wonderfully full blend. In the scoring Shipwreck came in only a bit behind the two KBS vintages at the top of our lists. You would never guess the alcohol content as being nearly as strong is it is. Really well made. These beers are not simply watered down Basil Hayden. Kentucky Ale spends only a few weeks in the barrels, but that is enough to make it an interesting alternative to a strong ale if you like your beer sweet. The KBS, Black OPS and Shipwreck are dynamic, bourbon-y vanilla/mocha masterpieces. Seek them out when they are available. One note about availability. Other than the Kentucky Ale, the beers reviewed here are very limited in their availability. Brooklyn hardly acknowledges the existence of Black OPS, Shipwreck is scarce, and people take vacation days just to line up at the Founder’s brewery for the chance to get a few bottles of KBS. Ask your local beer vendor–try late winter–or look for these brewers to have a few kegs at special events like the Great American Beer Festival.